There were some pretty big shockers during tonight's Love Island, including one poor couple being dumped after receiving the least public votes to save them. While the Islanders were living it up at the Island Beach Club, Caroline Flack turned up to crash the party and reveal that one of the couples were about to be packing their bags. It was soon revealed to be Ellie Brown and Charlie Brake who would be leaving the villa for good, leading to tears from the other Islanders. But it seems there are no hard feelings from Ellie and Charlie, as they've revealed that they have no regrets about their time in the villa. "It's mad coming out with somebody who you actually like and you actually have a connection with and who you are in a relationship with," Ellie said. "It almost seems too good to be true. We haven't even been on a date yet! So the first thing we need to do is go on a date. I feel amazing about it." One of the biggest moments of tension in the villa this year came when Ellie had a massive fight with Georgia Steel over Georgia's constant claims about being loyal, but Ellie has insisted that they're "in a very good place" now. "The argument Georgia and I had was heated, emotions had built up. We shocked ourselves with how well we dealt with it afterwards," she said. "We both apologised and then it was never really spoken about again. When I left, she gave me a kiss and a hug and she said 'I love you, can we be friends?' and I said I loved her back. We are in a very good place." 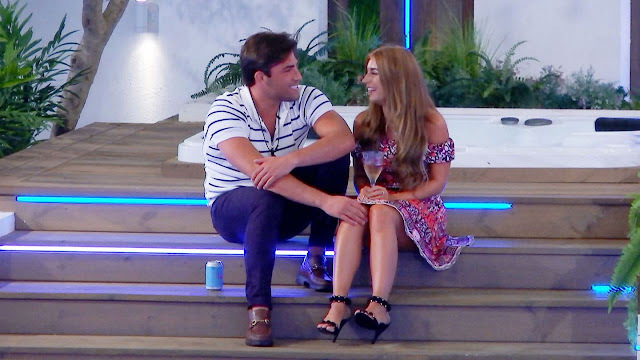 But two people who Ellie and Charlie have a heck of a lot of love for are Jack Fincham and Dani Dyer and they reckon the couple could be getting engaged in the near future. "Jack and Dani will be engaged by this time next year," Ellie said. "I think they'll be our winners and rightly deserved. They've been together from the start. "They are obsessed with each other. Living with them, you can see how in love they are. Jack is going to put a ring on it soon." And Charlie agreed, saying: "Jack and Dani definitely!" when asked which of their fellow couples would get engaged first.